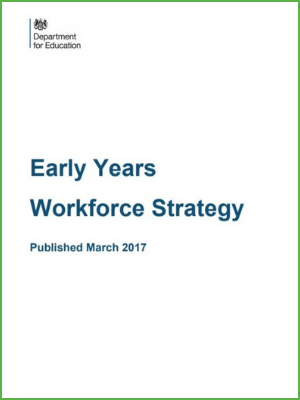 This Early Years Workforce Strategy from the United Kingdom details how the department for Women, Equalities and the Early Years plans to support the early years sector and remove barriers to attracting, retaining and developing the early years workforce. Enabling staff with Early Years Educator qualification who also hold level 2 English and mathematics qualifications, including Functional Skills, to count in the level 3 staff:child ratios. Consulting on allowing those with Early Years Teachers Status (EYPS), and its predecessor Early Years Professional Status (EYPS), to lead nursery and reception classes in maintained schools. Working with the sector to develop level 2 childcare qualfication criteria. Improving the quality of early years training and providing access to continous professonal development (CPD). Providing funding to support the sector to develop quality improvement support in partnership with schools and local authorities. This document further addresses challenges faced by the early years workforce and actions to be taken to address these.